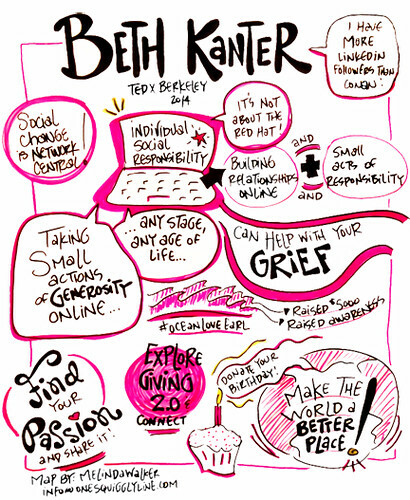 Earlier this month, I crossed an item off my bucket list when I gave a talk at TedXBerkeley. I spoke on the topic of “ISR” or what I call “Individual Social Responsibility. ” The idea is that when you give in small amounts – anything – your time, money, or skills and encourage your network online to amplify it, you can have a great impact as an individual. The point is that it isn’t about amazing a huge number of followers on social networks, it is about building relationships online, doing good online, and encouraging your network to do the same. I shared many stories, but started with the story of how Conant O’Brien made fun of my red hat because I had more followers than him on LinkedIn. I made the point that it wasn’t about popularity, but how you use your influence to do good in the world. For emphasis, I repeated the line, “It’s not about the red hat and tossed it.” (Photo captured by Renee Blodgett). The audience was primarily college students and after the event, several came up to me and thanked me for inspiring them to do a social good activity online. The talk is brief and you can view the video here. It was fun to hang out back stage with the other speakers which included Guy Kawasaki, Marnie Webb, and Kare Anderson – and many other amazing speakers who spoke to the theme: redesign, rethink, recreate. You can brief summaries here. I wanted to do a TedX talk because I knew that I would have to go through a creative process of mapping out my talk, practicing it, and deliver it in a huge auditorium to a large audience. While like many other speakers who have done this, I was nervous right before but once I get out there is an amazing experience. What I loved about the experience is that as a speaker you get a lot of support. Jennifer Barr, co-curator, was a splendid coach. We took long walks through an open space preserve where she patiently listened to me as a rehearsed and gave me great pointers. Give yourself enough time so you can map out your talk. I found that long walks away from the computer helped me get out of my head and think more creatively. Memorize the sequence and transitions and practice out loud. Once you have it committed to memory, practice being aware of your speed, tone, and body language. Be aware of your facial expressions. If you have a video camera, it is a good idea to practice and video tape yourself and review the tape. This helps you build in the moment awareness. Get enough sleep and exercise the week before you present – being tired doesn’t help your performance. Take deep breaths before you go out on stage and remember that being nervous is actually normal and can help you. Congratulations, Beth–that’s an incredible and well-deserved honor. Great job! That’s a great bucket list item to cross off. I love that you added drama with your signature red hat! Congratulations.